Everyone loves playing music stoned, but the (high) times they are a-changing. No disrespect to Bob Dylan covers strummed on “the quad” or psychedelic arsenals of guitar pedals, but these are instruments of marijuana’s past, best paired with a crumbling joint or resin-caked glass pipe that looks how a Jimi Hendrix guitar solo sounds. The future of playing music stoned is electronic, and there’s no more fun way to make electronic music than on a modular synthesizer. And there’s no better way to do it than while stoned. Except when it becomes a nightmare. 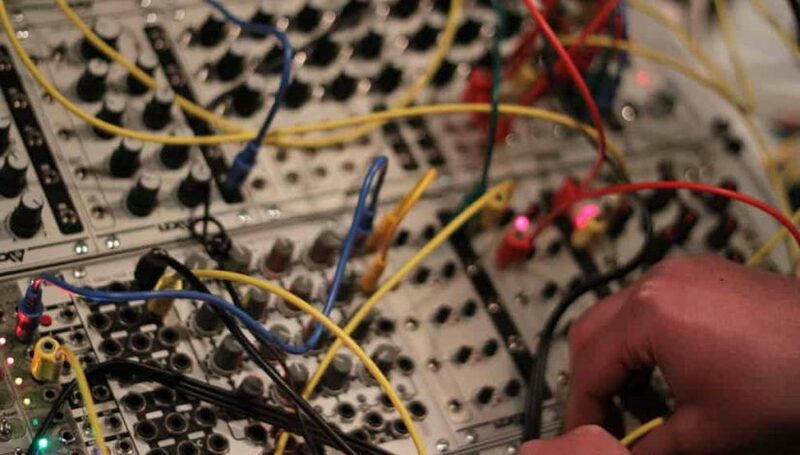 Modular synthesizers are complicated, expensive, and wonderful instruments. Unlike a conventional synthesizer comprised of a keyboard with electronics under the hood that give a distinct sound, modular synthesizers are, well, modular. You buy one module at a time that serves very specific functions, then patch them together using the equivalent of aux cables. Ranging from simple tools to shape a sound’s attack and release to wildly creative units like spectral multiband resonators and morphing terrariums (which both make great names for weed strains). A tiny twist of a knob makes a simple electric volt sound like tubular bells, a lawnmower starting underwater, or an alien conversation. Marijuana isn’t addictive, but modular synths are. Imagine a deck of Magic: The Gathering cards, except that each card unlocks a type of noise, chops it into pulsing waves, reverses it, delays it. Unfortunately, it isn’t a cheap hobby. If you want that fetishized Three Sisters filter expect to throw down $350 retail, or hawkishly monitor used listings on various message boards or Facebook groups. Even modest rigs end up costing thousands of dollars. But oh the places you’ll go. Traditional music theory and composition skills are useful, but playing a modular is really more like painting with sound than finger-picking through scales. Every system is different and customized to the user’s sonic tastes. Want to make massive M83 walls of noise? Brooding Radiohead swampscapes? Thumping minimal techno? There’s no limit to the possibilities. There’s little research on why exactly music sounds better high, let alone why playing it is more fun, but one oft-quoted explanation comes from The World In Six Songs by neurobiologist and music producer Daniel J. Levitin. One way modular synthesizers keep you in the moment more than other instruments is that they almost play themselves. Typically they’re driven by a sequencer, so it’s easy to loop a pattern infinitely. Some people do compose harmonic symphonies with these things, but it’s much easier to toss music theory out the window and just patch a clock signal into a delay module and turn a simple sine wave to a polyrhythmic soup. When you’re deep into a session, there’s a true feeling of “play” that’s hard to achieve on other instruments without serious technical chops. As such, it’s easy to forget that you’ve been listening to the same pattern repeating endlessly for an embarrassingly long period of time. Tweaking a pulsing low-frequency oscillator isn’t really that different than staring at a lava lamp. It’s also the worst instrument to play while stoned because they’re incredibly hard to use productively, especially when played through sativa-tinted glasses. To make a needlessly graphic metaphor: if bedroom guitar solos are masturbatory, then modular synths are like a fleshlight. The hours I’ve spent twiddling out magic sounding tones have not resulted in much actual music. The possibilities are so endless, as soon as I stumble my way into a melodic pattern that’s worth using in a song I’m already turning it into something new. Going back to the recordings the next day with the haze removed can be shocking, a harsh realization that you’ve been making beautiful noise that no one else would ever want to hear. Another modular synth knock is the learning curve. I’m afraid to even try to explain how these things work for fear of being trolled (hi haters). I’m still very new to modulars and still spend every session with manuals open and Youtube tutorial videos. Then there’s also the lengthy asides where I’m trying to understand why my system suddenly stopped making sound. When stoned, it’s disheartening, to say the least, and anyone who’s self-conscious about marijuana’s effects on cognitive functions will find themselves questioning whether another hit is really a good idea… or, the very best idea. So, is this choose your own adventure of sound for you? That entirely depends on what type of smoker you are. If you’re a gearhead who loves collecting things, a techie with an electrical engineering minor, or just someone who loves to turn knobs and make jaw-dropping electronic noises, the answer is yes. But if you respect the sanctity of your savings account, have a low tolerance for reading manuals, or want to maximize the productivity of your time playing music, this is not the instrument you’re looking for. As for me, I don’t plan to stop my journey into the world of modular synthesis anytime soon, even if I don’t have much to show for it aside from a desk cluttered with manuals and an angry neighbor. The post Why Modular Synthesizers Are The Best (and Worst) Instruments to Play Stoned appeared first on High Times.